The main body of the Battalion arrived Nui Dat on 27th December 1967. 3 RAR became the third battalion of the Task Force necessitating an extensive building programme to establish a further base camp in the south-eastern extremity of the base. A short period of acclimatization allowed 3 RAR to feel its way in the theatre and to familiarise itself with the operational techniques of the Americans and Vietnamese. 3 RAR’s first operation against the Viet Cong (VC) began at the start of the TET Offensive. Subsequent operations were undertaken in and out of Phouc Tuy Province. The Battalion was employed on mine clearing, counter mortar and rocket tasks and on reconnaissance-in-force operations. During the 25th and 28th May 1968 3 RAR, while in a battalion defensive position, withstood two determined assaults by regimental sized units of the North Vietnamese Army at fire support patrol base (FSPB) Balmoral. While in Vietnam 3 RAR once again formed many close ties with supporting arms and services and the RAAF. The Battalion was proud to be associated with 161 Field Battery of the Royal New Zealand Army (RNZA), a 105mm howitzer battery of 16 Field Regiment which supported 3 RAR during the Battle of Kapyong in Korea in April 1951. The Battalions tour in South Vietnam was the first time National Servicemen had served with 3 RAR on active service. Their devotion to duty was in the highest traditions of the Australian Army and helped to maintain the proud reputation and espirit de corps of ‘Old Faithful’. The Battalion’s casualties were 24 KIA and 93 WIA. 3 RAR embarked on the HMAS SYDNEY on 20th November 1968 and returned to Adelaide on 2nd December 1968. 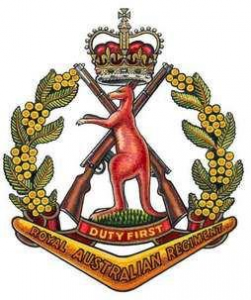 1971 saw 3 RAR return for its second tour of duty on active service in South Vietnam. On 12th February 1971 the advance party moved by air to South Vietnam followed by the main body on 16th February 1971. Although operations were undertaken by the Battalion in and out of Phouc Tuy Province, the main emphasis was placed on operations east and north-east of Nui Dat to prevent enemy infiltrations and attacks around the Xuyen Moc District. During this time 3 RAR had a number of day long bunker contacts with D445 VC battalion and local guerrilla forces. On 6th – 7th June in southern Long Khanh Province the Battalion located and attacked an extensive bunker complex occupied by 3rd Battalion, 33rd North Vietnamese Army (NVA) Regiment. After a long battle involving artillery, armour, Australian and American helicopter gunships, the complex was found to contain 47 bunkers as well as training areas and kitchens. In August 1971 the then Prime Minister of Australia announced the withdrawal of 1st Australian Task Force (1 ATF) combat troops from South Vietnam. Although 3 RAR’s second tour of active service in South Vietnam was only eight months in duration, the Battalion completed many successful operations against the enemy. Following a commemorative service and farewell parade on 5th October 1971 the Battalion sailed for Port Adelaide, South Australia on 6th October 1971. During 3 RAR’s tour on active service in South Vietnam in 1971, four soldiers were killed in action.